Q: I want to print multiple pages per sheet of my PDF document. Is this possible in PDF Studio? A: Yes, this feature was released in PDF Studio 11. There is a new “Pages per sheet” option under the new “Multiple” tab that will allow you to select how many pages you want to print per sheet. Below is an example on how this feature works. NOTE: This feature is only available when using the Advanced Printer dialog. 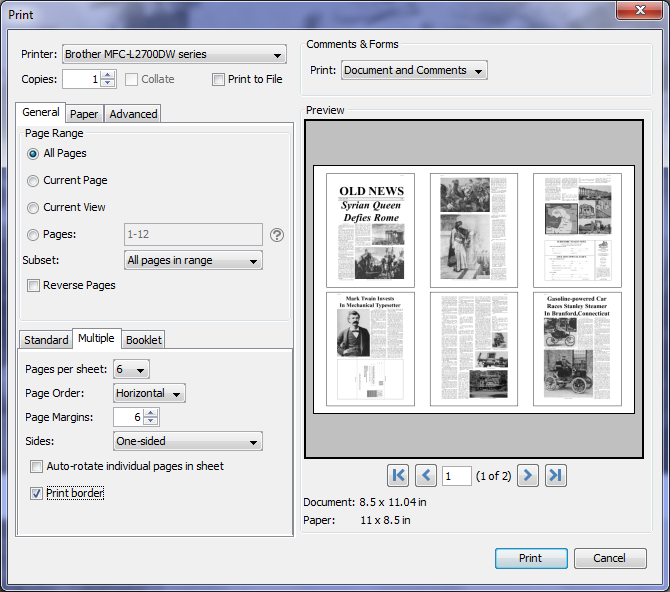 See How to Change Default Print Dialog to set the advanced print dialog. 2. Click Multiple tab, select pages per sheet dropdown box. By default, this value is 4. In this example, “Pages per sheet” is set to 6. 3. You can change the page order, page margins, sides, border … and the Preview area will apply the changes accordingly. 4. Click “Print” to print the document.